Cartridge gun that is extremely durable to every day and extended use. It features a heavy duty trigger and release mechanism. 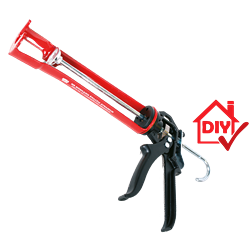 The heavy duty gun of DUROSTICK is ideal for easy application of polyurethane sealants and adhesives as well as acrylic putties and silicones. Its exceptional strength makes it necessary to combine with the BLANK CARTRIDGE of DUROSTICK. Apply with ease and accuracy, sanded grouts of DUROSTICK in dozens of applications like grouting absorbent decorative bricks, rustic tiles and cotto etc. as well as honed marble. It ensures daily performance, without failures or problems.